FPH Tank Installation maintains and cleans petroleum tanks for commercial, industrial and municipal agencies. 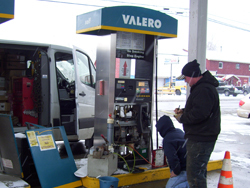 Fuel Tank Inspections and equipment repair are an integral part of preventative maintenance to keep your equipment operating properly and safely. We offer all tests that are mandated by local, state & federal agencies in both VT and NH to keep up with your state compliance regulations. Penalties for non-compliance can result in large fines and/or closure and to continue operating safely, you are required to keep up with all compliance standards. We will gladly handle all your tests, keep you on an annual plan so you won’t have to worry about it, keeping you current and in business. At FPH Tank Services we test the entire system including tanks, lines, and Fuel Leak detectors, with little to no disruption to your business. All work is performed by our licensed & certified technicians. And with our broad service area, there is always a technician nearby to handle your tests. FPH will perform system maintenance on the spot, so you won't have to call out another service company to make repairs.